LoveIt is a great tool for design and architecture inspiration. Check out this cool LoveIt Collection that was created to house creative ideas for our new LoveIt HQ we’ll be moving into end of Sept! What are some creative ways you use LoveIt? Content Importer — Users can import their entire Pinterest boards or multiple images from their account to share on LoveIt. While initially built to allow users to import their content from Pinterest to LoveIt, additional sites will be added based on users’ requests. Multiplicity — Users can quickly “love” several of their images in one simple step from anywhere users keep them, such as Instagram, Tumblr, Flickr and the user’s blog. These images can be added to one collection or various collections with similar or unique descriptions. Batch Uploads — Users can highlight and upload numerous images from their personal computers. This allows users to share more of their personal, offline image collections with friends, family and other interested parties. “A cornerstone of our strategy is listening to our community and building the tools our users request to make their LoveIt experience the best it can be. Features like the Content Importer were designed in response to popular requests for fast, simple ways for users to share their images and work from existing platforms, like Pinterest, on LoveIt too,” said Ron LaPierre, Co-Founder and CEO of Love It, LLC. +1 for importing from Pinterest. Awesome. With the import it brings the original source it was bookmarked/pinned from too. HUGE plus for content owners. The Content Importer tool includes an algorithm to automatically credit the original content source as users bring the images into LoveIt. Removing extra clicks improves the users’ social discovery experience by taking them directly to the original source of the image, and to the valuable content the source provides along with the actual image. Along with the release, LoveIt is providing code for websites that want to block LoveIt users from adding the content from their sites to LoveIt collections. The code can be copied from the LoveIt website and pasted on any other website. Additional new features include offering Twitter as an alternative to Facebook registration, enhanced Facebook functionality with open graph integration, the ability to find Facebook friends who are using LoveIt and invite Facebook friends to join LoveIt. Love It, LLC is a privately-held company based in Pasadena, California with 21 employees. The Company was founded in 2011 by Ron LaPierre, Tom Soulanille and Wei Guo alongside its two active board members, Harry Tsao and Talmadge O’Neill of Juvo Capital. Blending their decades of Internet industry expertise, they created LoveIt – a platform where visual sharing and social networking meet. On June 7th, 2012, LoveIt launched open to the public having raised a $6M Series A round of funding. LoveIt is a site for individuals and groups to discover, collect, organize and share photos they love via public or private collections. In addition to private collections and intuitive drag-and-drop organization tools, LoveIt’s powerful, patent-pending recommendation engine provides a more engaging and dynamic user experience. Sprite Creator. This program allows you to upload an image and select areas of the image to create the css for that sprite. This generator lets you ignore duplicate images, resize source images, define horizontal and vertical offset, define background and transparency color, assign CSS class prefixes and various other things. It also supports many languages. The source code is available for downloading and is covered by a BSD license. Want to run a local copy? Well, you can do that, too. A Java-based desktop application that parses special directives that you can insert into your original CSS to mark individual images to be turned into sprites. It then builds sprite images from the collected images and automatically inserts the required CSS properties into your style sheet, so that the sprites are used instead of the individual images. Add a custom iframe tab for your facebook fan page! 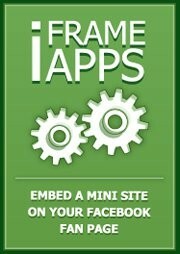 No need to be a facebook developper in order to install an Iframe app on your facebook fanpage! Every Facebook brand page owner have to make it more engaging in order to turn visitors into fans, leads and boost sales by means of promotion on social media. These are the best templates and utilities for your facebook fan pageIframe apps also provides many services that a facebook fanpage could require such as contact form, live streaming or many other utilities that will enable fans to get a better overall knowledge of your brand. Iframe apps and other “install and play” apps for free!The best part about our service is that you are able to use iframe apps and other “install and play” apps for free! There are some options when you run the bookmarklet. Here is some explanations. Toggle a fake keyboard So, you can see how much space is visible when users are entering data in forms. Toggle CSS Refresh As soon as you save a CSS-file, the changes are directly implemented, without having to refresh your browser. It only works in a server environment. What is your channel going to be about? You can bet that there are already channels on the subject you have in-mind. It’s important to think of an angle, a unique twist that will make your channel different and offer something more unique to your viewers. What software and hardware will you need to get started? Take a moment to figure out if you’ll need to step up your editing software or buy a new camera. Another important question to ask yourself, “How often will I be uploading videos?” Set realistic goals based on your lifestyle. Take a look at the top featured videos and skim through the usernames. Some are long, some are a bit generic but what you’ll find is that most are short, catchy and memorable. Thinking of a name that will stick in people’s heads is what you’re looking for. Think about your channel, the direction it may lead in the future and write down names that are short, sweet and make sense even of the direction of your channel changes over time. Once you have a list, seek out other’s opinions on which username you should use. Ask your friends and family or take to message boards a chatrooms for more opinions to help you decide. How would you like your audience to view your channel and your videos? What style, flare or uniqueness would you like to come across in your videos and on your channel background? It’s time to think about intros and outros for your videos, or will there be any at all? Sometimes it’s best to let more skilled individuals handle the more involved editing tasks. Your YouTube channel background is also seen by users from time to time. The channel background should reflect the content you are providing. Your Avatar can reflect your username and be branded with a logo that you might use in your videos. Once you have your channel setup and a few videos for users to watch, bring awareness about your channel and videos is should be top priority. Marketing is all about presenting your content to as many people as possible while targeting those who you know might be interested. You’ll want to create a Facebook fan page and Twitter profile. These two social networking sites will allow users not on YouTube to be exposed to your channel. Don’t hesitate to interact with users on Facebook and Twitter in-order to gain fans and followers. The above can also be applied to YouTube. Find channels and videos that are in the same genre as yours or find videos that you know its viewers might have an interest in your videos. Subscribe to those channels, comment on those videos. Let others know by the way you comment that you know what you’re talking about. A sneaky trick is to leave comments that will almost certainly get replies. This will expose more users to your comment and to some extent, your channel. Don’t spam! Excessive commenting or comments that just say “go check out my channel” will get marked as spam and could lead to your channel being suspended. As mentioned before, take time that you know you’ll have available. If you have all the time in the world, make a video 5 times a week, if you don’t, find out how much time you can set aside each day of each week to put towards your channel. However you do things, stay consistent! Your viewers and subscribers will slowly begin to trust and view your channel as an authority on the subject (whatever that may be.) Subscribers will come to expect to be entertained, educated, etc., by your videos on a regular basis. It’s important to stay consistent and put out videos at the same time each week. Never let your channel, your video comments, your Twitter and Facebook page stand still. Continue to put in a little time for each component regularly. Make small achievable goals and as you pass one, set your sights on the next. Stay focused, persistent and your channel will be a success in no time.